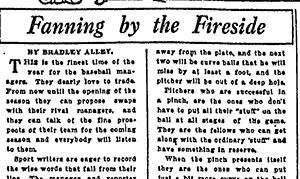 Six months later, on January 22, 1913, a newspaper scoop in The Worcester Telegram in Massachusetts revealed that Thorpe had played minor league professional baseball in 1909 and 1910. Back then, “professional” was a dirty word because it meant money had changed hands. Only “simon-pure” amateurs were allowed to compete in the Olympic Games. 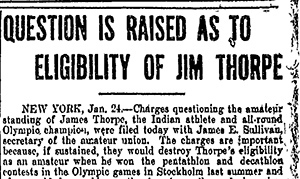 Thorpe had signed the official International Olympic Committee (IOC) Entry Form, attesting that he had never played any sport for money and therefore qualified as an amateur. At a time when so many organized sports were in their infancy, the ensuing reaction and repercussions, worldwide, would cause the Thorpe revelation to be dubbed the mother of all sports scandals. 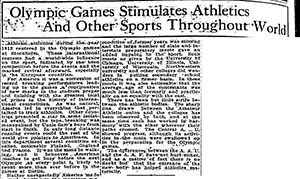 The modern Olympic movement was brand new; its first Olympiad had been in 1896. The identity and credibility of the struggling IOC as an amateur organization were seen to be at stake. The American Athletic Union (AAU), co-functioning as the American Olympic Committee, as it was called then, saw itself as the vigilant guardian of the ideal of amateurism and led the rush to judgment. Mere days after the scoop, Thorpe confessed, and the AAU put his two gold medals and his challenge trophies on a ship back to Stockholm. 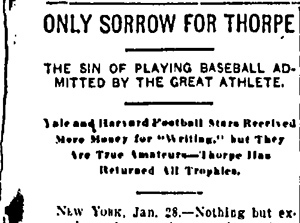 Thorpe immediately turned professional officially, signing with the top baseball team of the era, the New York Giants. One reason I wrote Native American Son: The Life and Sporting Legend of Jim Thorpe (Knopf, 2010) was to understand why this scandal and its aftermath continued to inspire heated passion and anger for the rest of the century and into the next. The story just would not die. 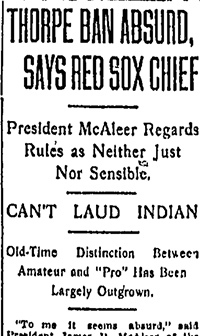 With access to America’s Historical Newspapers, following publication of Native American Son, I was able to get a broader sense of the impact of the scandal in 1913, as recorded in U.S. newspapers of the time. 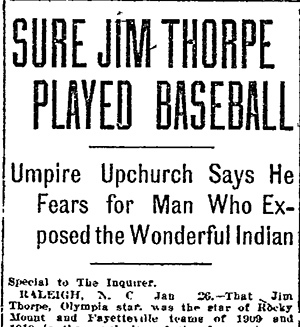 In a special report, The Philadelphia Inquirer, under the headline “Sure Jim Thorpe Played Baseball. 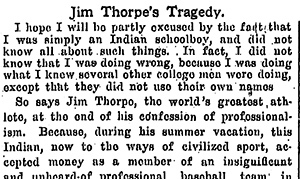 Umpire … Says He Fears for Man Who Exposed the Wonderful Indian,” presented a detailed analysis of Thorpe’s lackluster baseball statistics during those two summers and the insistence by North Carolina newspaper editors that they all knew the great Olympian had played professionally in their state. A mystery, never to be resolved, was why no one had blown the whistle earlier. As the scandal’s details and ramifications became established to the public around the world, the core issue—that would have lasting influence on the history of sports in the twentieth century—came in for intense scrutiny: amateurism versus professionalism. 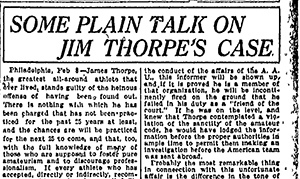 “To me it seems absurd that Jim Thorpe should be considered a professional in track sports because he has played baseball professionally. 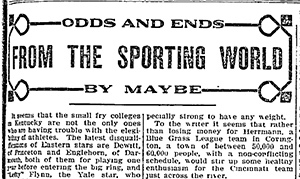 Though argument about Thorpe’s fall would continue for months, years and decades, by the second week of February newspapers began to step back and assess the greater and lasting legacy. Kate Buford is the author of Native American Son: The Life and Sporting Legend of Jim Thorpe (Knopf 2010), an Editors’ Choice of The New York Times. The paperback was published in 2012 by the University of Nebraska’s Bison Books. She is also the author of the critically acclaimed and best-selling biography, Burt Lancaster: An American Life (Knopf 2000), an Editors’ Choice and Best Book of 2000 for The New York Times, Washington Post, and Los Angeles Times. The paperback edition (Da Capo Press, 2001) was named a “New and Notable Paperback” by the Times. U.K. hardcover and paperback editions were published by Aurum Press, the most recent edition in 2008. Prior to her writing career, she was the law librarian for Davis Polk & Wardwell and Cravath Swaine & Moore in New York.